The Mara-Amu is one of the most popular of the 47 tropical drinks on The Mai-Kai’s vast menu, due in part to the fact that it’s the only one that comes in a Tiki mug you can take home after quaffing your cocktail (others require a special trip to the gift shop). The mugs have remained generally the same over the decades, but occasionally you’ll discover a different glaze or an entirely different design (see bottom photo). Since they’re given away with the drink, Mara-Amu mugs aren’t especially rare or hard to find. Check the Ooga-Mooga mug collectors site for recent prices and lots of photos. 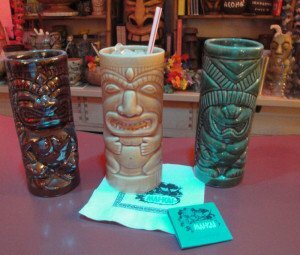 The mug is iconic, however, and inspired a Tiki that now stands in a prominent spot in The Mai-Kai’s famous outdoor gardens. 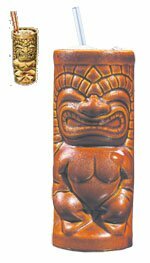 The Mara-Amu Tiki is unique, created by South Florida artist Will Anders when he was toying with the idea of making Tikis from foam. The idea was they could withstand the elements better than wood, and be easy for people to install in their outdoor pools and Tiki bars. They ended up being more difficult and costly to carve (and also susceptible to lots of superficial damage inflicted by unrespectful guests), so the idea never took off. One of Anders’ claims to fame is his role in restoring the smaller Tikis in The Mai-Kai’s gardens. 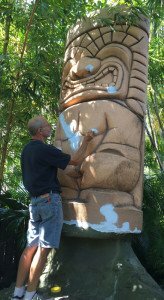 He was given access to molds created by late owner Bob Thornton from the original wooden Tikis, and over the years has re-created many of them in concrete. As you meander through the lush tropical paths in the gardens, much of what you see are re-creations by Anders. He also carved a giant new wooden Tiki, dubbed King Kai, that stands near the Mara-Amu in the gardens. See the full story and photos of the creation and installation of this 10-foot icon in May 2016. Though it has been in the gardens for just a few years, the story of the Mara-Amu carving goes back more than a decade. 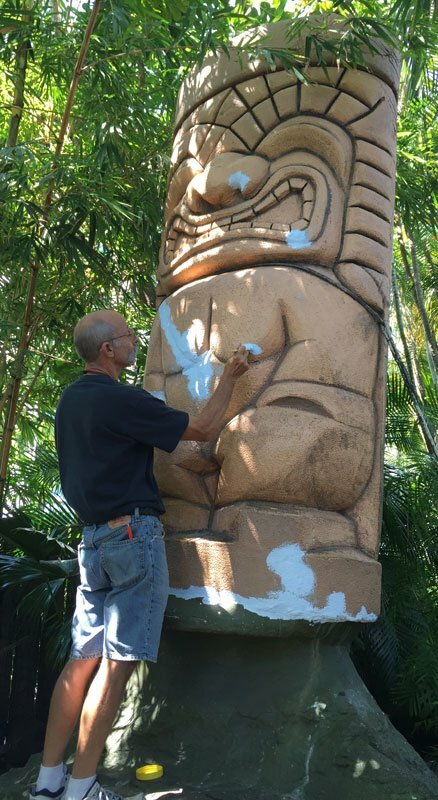 When manager Kern Mattei heard that Anders was making giant Tikis from foam, he asked the artist to create something for The Mai-Kai. Anders decided the mug would make a great subject. So he supersized the famous drink vessel into a Tiki 8 feet tall, 4 feet wide and 44 inches deep. It spent some time at owner Dave Levy’s home before being installed in a secluded corner of the gardens, in an employees-only area around the corner from the kitchen. 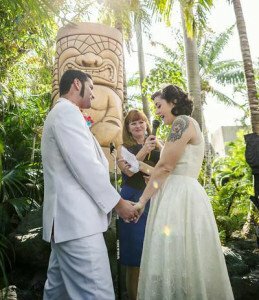 Most guests probably never saw it in its prior location, but it was moved around the beginning of 2015 to a high-profile spot where guests take photos and many hold wedding ceremonies. It was called into service, unfortunately, when another of The Mai-Kai’s old wooden Tikis fell victim to the elements. As envisioned by Anders, the foam Tiki is better able to withstand the weather. However, it still gets “beat up” by guests, Anders said, so in September 2015 he gave it a complete restoration. He filled in and repaired all the gouges and nicks, then gave it a fresh paint job using the exact color that he used a decade ago when he matched it up with the mug. “It looks like new,” he said. Tahitian for “when the west winds blow.” This is the rum punch the islanders drink. Order with or without keepsake mug. Flavor profile: Passion fruit, lime, gold rum. Review: Like a Sweet Tart in a glass, with a nice rum kick. Ancestry: Created by The Mai-Kai’s original mixologist, Mariano Licudine, the Mara-Amu is a slightly less potent version of an earlier drink he invented called the Big Bamboo. 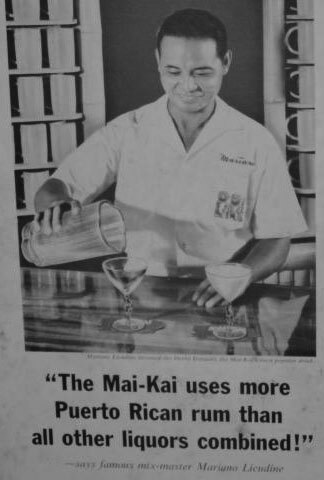 Bilge: The Big Bamboo is reportedly the secret drink that members of the Okole Maluna Society earned by working their way through every drink on the original Mai-Kai menu, according to Jeff “Beachbum” Berry, who published both recipes in his seminal Tiki cocktail books. [Click here for the recipe and more info] The Mara-Amu was first spotted on the cocktail menu in the late ’70s, though it may have been featured earlier. Blend at high speed for exactly 5 seconds. Pour into a tall glass or Mara-Amu mug. * Like most of the cocktails at The Mai-Kai, the Mara-Amu benefits from the unique fresh-squeezed juices that are hard to duplicate. We now recommend a special blend of fresh-squeezed Persian limes and bottled key lime juice to achieve the rich and tart flavors of The Mai-Kai’s lime juice. Fresh orange juice from local Florida groves is another key element. Squeeze your own or find a brand that features 100% pure Florida orange juice. The Mai-Kai’s grapefruit juice is also fresh from a local grove, but it varies between pink and white depending on the season. We prefer the more sour and tart white grapefruit juice. If you must buy a store brand, again look for a product that’s 100% natural, no sugar added. A vintage Rums of Puerto Rico ad featuring Mariano Licudine. * As usual, we recommend a good brand of passion fruit syrup (not juice). There are many available online, such as Fee Brothers, Small Hand Foods, B.G. Reynolds, Aunty Lilikoi, Finest Call and Monin. Or you can try making your own by checking for recipes online or in Beachbum Berry’s books. * Several sources, including The Mai-Kai website, recommend gold añejo rum. There are many fine choices for white and gold Spanish-style rums, but a good place to start is Don Q Cristal and Don Q Añejo from Puerto Rico, which are traditional rums that have been served at The Mai-Kai throughout its entire history. You could also try Cruzan or the premium Bacardi labels. The Mai-Kai likely uses their standard well rums, a variety of rums from Cruzan that are sold in bulk and bottled under the Ron Carlos label (see photo). While these are considered to be standard bottle-shelf spirits, Ron Carlos Dark is the best of the bunch and can add a decent amount of flavor without overwhelming the drink. If you like a little more flavor or funkiness, try the dark Jamaican rums from Coruba and Appleton. 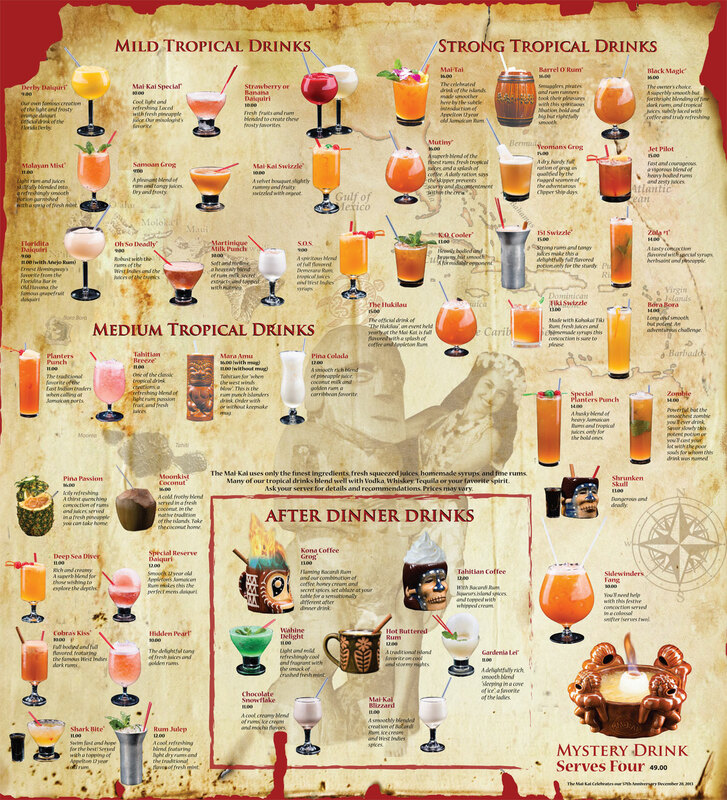 The Mai-Kai employs Appleton Estate Reserve Blend and Appleton Estate Rare Blend in a wide variety of cocktails. Click here for a deeper dive into the story of dark Jamaican rums at The Mai-Kai, one of Licudine’s signature flavors. If you’re looking for a slightly bigger flavor, try the Big Bamboo. The ancestor to the Mara-Amu contains the same juices and syrups, plus similar rums. The main difference is the proportions, with the Mara-Amu containing 2 parts juice to 1 part rum, while the Big Bamboo is a tad stronger with 1 1/2 ounces of rum for every 2 ounces of juice. The Big Bamboo is also less sweet and more spicy with the inclusion of Angostura bitters. Plus, it contains some signature gold and dark rums, giving it an extra kick. This entry was posted in Cocktail reviews, Cocktails, Cocktails, History, Mai-Kai, Recipes, Rum and tagged Beachbum Berry, Big Bamboo, Bob Thornton, Dave Levy, Kern Mattei, Mara-Amu, Mariano Licudine, mug, rum, Tiki mug, Will Anders. Bookmark the permalink. Turns out The Big Bamboo was NOT the drink for members of the Okole Maluna Society. There was an actual Okole Maluna drink by Mariano. This will be explained further in your upcoming book, I hope. Can’t wait! This makes sense. 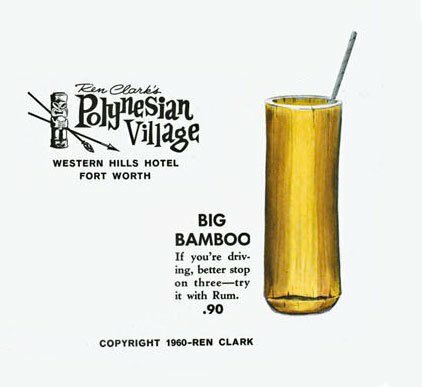 Even the Ren Clark menu had a drink called Big Bamboo, so obviously the drink was well known. Since the Okole Maluna Society was not, the actual drink served was probably known only to a few members, and not the general public. That means we have a different recipe. I’m guessing then that The Big Bamboo was just another ‘lost cocktail’ like all the others on the Mai-Kai’s menu. Clearly, the drink’s name was just a reference to the bamboo vessel it’s always served in. The fact that the Okole Maluna German stein mug was bamboo, may have been a coincidence and the root of the confusion. Do we know for a fact that the actual Okole Maluna drink by Mariano was served in this vessel or was it just as a showcase piece to display a member’s name? Either way, the name ‘Big Bamboo’ seems to have been somewhat well known. In the case of the Ren Clark drink, again, the name appears to just be a reference to the large bamboo-style mug the drink came in (as shown on the menu illustration) – possibly, a direct rip-off of the Mai-Kai’s drink, which must have appeared in print at some point in time.